Check our full collection of html5 video player wordpress plugins. All our HTML5 Video Player WordPress Plugins can be used in websites which are responsive. Option to activate Google Analytics tracking. You’ll be able to see how many times each video file was played. Once you’ve bought the products, you can download for free, from your account, all the updated versions. and is a top-notch responsive HTML5 Video Player WordPress Plugin compatible with all major browsers and mobile devices. For YouTube and Vimeo, all you need to use is the video ID. You have available a button to show or hide the playlist. Also option to start the video player with the playlist hidden. You can choose from the 2 skins available: back & white. Also, from parameters you can create any color scheme. For Universal WordPress Video Player you can show the playlist thumb, title & description or hide one of them. HTML5 VIDEO PLAYER WordPress Plugin WITH YOUTUBE, VIMEO AND SELF-HOSTED SUPPORT. the Envato’s Most Wanted contest winner in the category in the category “Best HTML5 Stand Alone Video Player”. is ideal if you want a video player which will support YouTube, Vimeo and Self-Hosted videos. It has the option to be also used as a Full Screen Video Background for your pages, so it will allow you to create awesome websites. Solid plugin. iTheme's VidEmbed isn't working at the moment in widgets, and they can't give me an ETA for a fix. I had been looking for a solid, simple alternative. Especially something that would allow me to do a simple video and completely disable video controls. I couldn't disable controls out of the box (only auto-hide), but the developer quickly gave me two lines of code that completely hid controls even on mouse-over. Supports everything I need from a video player on my video site. and this plugin fixed the problem right away! This video player is perfect for creating video playlists within a Wordpress site using videos hosted externally (eg on Amazon S3). I received excellent support from the developer who fixed a bug within a day of me reporting it. Croc-embossed leather constructs this modern. YouTube, Vimeo and Self-Hosted videos. it will allow you to create awesome websites. Can be used as a full-screen video background for your website. The video will cover the entire screen without any black stripes. Optional parameter to add a texture over the images. So you’ll not have to modify each image to add the texture. 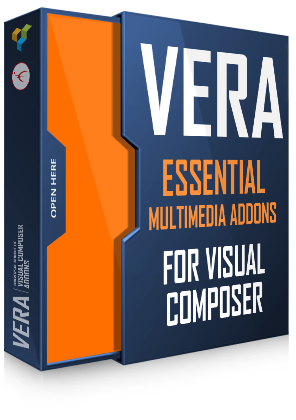 VERA brings together multiple responsive plugins including audio, radio and video players, logos showcase, multimedia carousel, that will make your WordPress application sing! Once you purchase this visual composer addons bundle, you regularly receive free updates. And more than this, you will not have to pay anything for the new products that we will add to the package. 16 photo transition effects like fade, blocks, slide, stripes and more. The product can be used as an YouTube Vimeo video player or as a multimedia slider. Almost all the plugins you need to create a complete and professional WordPress website are founded in THE MOST WANTED WORDPRESS PLUGINS PACK: Premium Sliders, Video Players, Logos Showcase, Full Screen Image Or Video Backgrounds, Audio Players, Radio Players, Image and Video Galleries, Carousels, Countdowns.